When you go green you help to maintain the equilibrium of the environment. Global warming, land pollution, air pollution and other such environmental hazards are all lessened when you go green. We @ eTravelSmart strongly believe in this initiative and hence have not only designed this unique initiative but also implemented in reality with more than 500+ saplings. Our responsibility not only ends in plantation but also in extending nurturing support to ensure that these saplings become trees over a period of time. 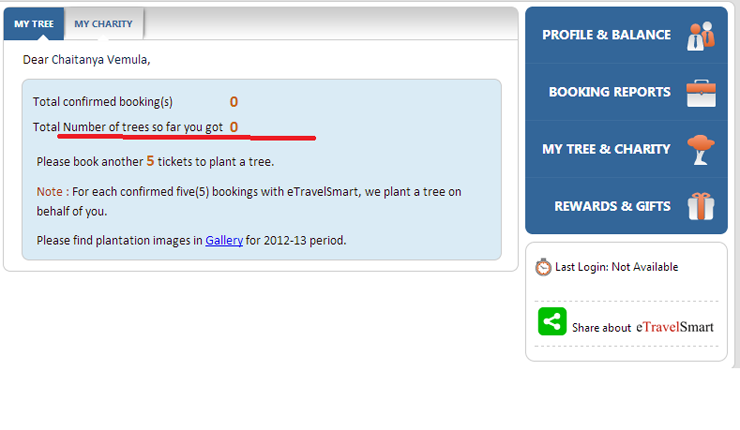 How does this work:For every 5 bookings with us, you earn a tree for your credit. You can see the live status of your tree credits while booking tickets/in your account at any given point of time. Once we have 100 credits accumulated for customers, we go ahead along with our customers & team for plantation by choosing a particular place/site. The recent plantations done by our team can be seen in the "Gallery" area on our site. What are you waiting for... join your hands to be part of this "Green" initiative and to be proud brand ambassador of this wonderful event at @ eTravelSmart! Book bus tickets online to get a tree planted on behalf of you. Check out number of trees that are planted on behalf you in My Tree from My Profile Section.